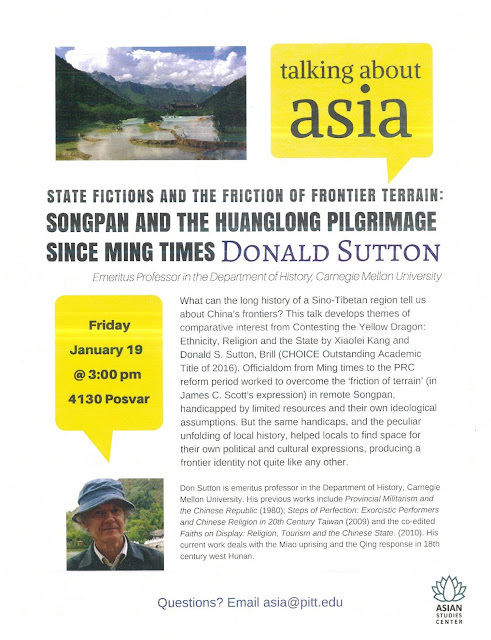 PennsylvAsia: "State Fictions and the Friction of Frontier Terrain: Songpan and the Huanglong Pilgrimage Since Ming Times," January 19 at Pitt. "State Fictions and the Friction of Frontier Terrain: Songpan and the Huanglong Pilgrimage Since Ming Times," January 19 at Pitt. The University of Pittsburgh's Asian Studies Center will host Donald Sutton of Carnegie Mellon University and his talk "State Fictions and the Friction of Frontier Terrain: Songpan and the Huanglong Pilgrimage Since Ming Times" on January 19. What can the long history of a Sino-Tibetan region tell us about China's frontiers? This talk develops themes of comparative interest from Contesting the Yellow Dragon: Ethnicity, Religion and the State by Xiaofei Kang and Donald S. Sutton. Officialdom from Ming times to the PRC reform period worked to overcome the "friction of terrain" in remote Songpan, handicapped by limited resources and their own idealogical assumptions. But the same handicaps, and the peculiar unfolding of local history, helped locals to find space for their own political and cultural expressions, producing a frontier identity not quite like any other. It starts at 3:00 pm in 4130 Posvar Hall (map) and is free and open to the public.